For the filling, put meat through a met-grinder, combine well with chopped onions, cubed fat, salt and spices. To make dough, add warm water and salt to sifted flour, let stand for 30-40 minutes. Roll out dough into 3-4 mm layer and grease surface with melted butter. Roll up the dough tightly forming a log, and cool. Cut log into 70 g of pieces and place on their flat slice. Roll out into small flat rounds. Place a spoonful of filling in the center, pinch edges around the filling forming oval pastry, and completely enclose the meat. 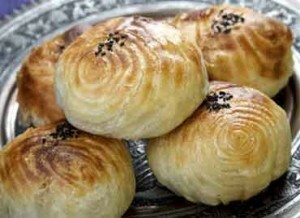 Stick samsa to the hot walls of tandoor, sprinkle water on top, and bake 25-30 minutes. ISO , , , salt and black pepper to taste.